Last week, I was working at the concession stand during M’s track meet. This was my second time at this new volunteer gig, and I was feeling pretty good because I was no longer make rookie mistakes like tearing the entire lid off the ramen noodles (open just enough to get the hot water into the cup, then close it and perch a fork on the cup’s edge with the same quick-handed precision a restaurant chef might use to place a carrot flower or a balsamic drizzle on a plate). I still don’t know many of the other parents, really, because it is tough to chit-chat while also making change and finding a blue Gatorade, but, you know, it was fine. The M came up to ask if she was free on May 12th to go to prom. I pulled out my phone to check my Google calendar (I really don’t think I could function without my Google calendar), and while I was scrolling, asked, “Wait, do you want to be free? Or do you want to be busy so that you have an easy out?” She huffed impatiently, taking my question for hedging, when I’m really just a little slow with the phone. Our schedule was delightfully clear that day. Was. Because she trotted off to agree to go to the prom with a friend from track. For those of you who don’t have kids going to my kid’s high school, here’s the deal. They have one prom in the spring that’s officially for the juniors, and then for senior year, there’s a “senior gala” which is still a nice night out, but it’s less formal than prom, more like a cocktail party. Except without the cocktails, of course, because they’re too young. I find this entire system mystifying. In my high school, we had a Junior Prom in the spring of our junior year and a Senior Prom in the spring of our senior year the way the Good Lord intended it. Anyway, the juniors have been all abuzz with prom plans for literally months, but M’s a sophomore, so it wasn’t really on my radar. Until last Saturday, at the concession stand. 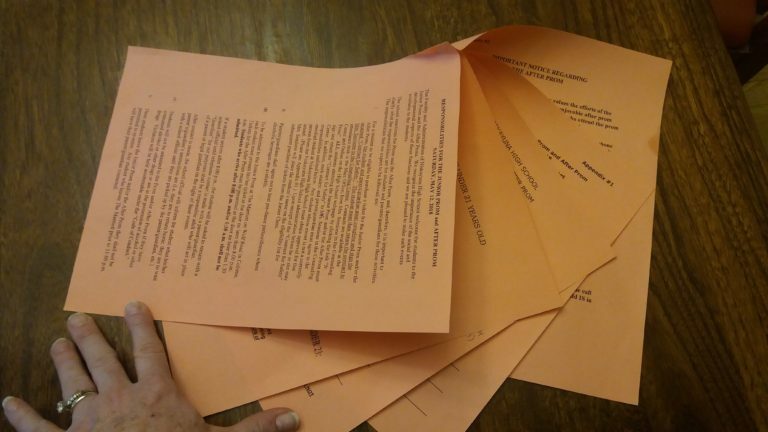 Oh and she got her ticket to prom, which is only available after bringing home this crazy-lengthy packet for a parent signature. Among other things, this packet reminds the kids that they can’t drink alcohol or take drugs and reminds us parents that we’re not to serve teens alcohol or drugs. Umm, didn’t we already know that? The packet includes two appendices. One of them is a special form to fill out if you’re bringing in some out-of-district riff-raff as your date. Another offers parents the opportunity to have a dedicated and vigilant team of PTO parents contact you in the middle of the night if your child hasn’t shown up to After Prom. That sounds positively dreadful. I did not check the “please contact me” box, and added a note: “I enjoy sleep.” Oh, yes, and apparently, the Prom has what I’d call a “Hotel California” policy. . . you’re not allowed to arrive too late or leave too early. Reading this packed, I felt like waving around my old lady cane and croaking to somebody, “You know. . . when I was a girl, it was assumed that we already knew we weren’t supposed to arrive to prom drunk, and that if we did, we’d get in trouble!” Then again, I distinctly remember going to at least one party in high school where the host’s parents had bought the keg and were looking on benignly from a window at the crowd forming in their driveway. So maybe it’s the parents who need the reminders? I don’t know. The parents who serve alcohol to minors don’t strike me as people who are actually going to read through a multi-page school packet, anyway. But whatever. Tomorrow M has a morning soccer game, but then we’ll spend Saturday afternoon looking for a dress. M is bringing along her friend and her little sister for emotional support and styling advice, and I’ll provide financing and transportation. We are hoping that we’ll just find something right away. For homecoming she only tried on about five dresses, so we’ll see how it goes. Of course, another complication is that she’s not supposed to have a dress that’s like anybody else’s, and here’s another modern innovation: there’s a private social media group specifically to share pictures of dresses to avoid duplicates. Apparently you’re better off just not even having a similar dress if you’re, you know, a lowly sophomore. So that’s another potential minefield. Plus, y’all know how much I love shopping! Bring. It. On. Oy. So, you’ll have to share with us when the fun starts. I am looking forward to the next episode.